The Executive Curl is the small round braid above a naval officer's rank, commonly found in navies that follow the British tradition. The story of the curl begins in the eighteenth century, when it was decided to give naval officers a distinct uniform to distinguish them from other officers of the crown. Precise rules for naval officer's uniforms were introduced in 1748. In 1783, lace was placed upon the sleeves of flag officers in addition to epaulettes. Later this was extended to all naval officers. There are two differing stories on the origin of the curl. On states that a certain Captain George Elliott had broken his arm in the Crimean War, and used the lace on his sleeve as a sling, creating the distinctive shape of the Elliot's Eye; which is a common nickname for the executive curl. The other story refers to a method for putting an eye (a loop in rope) in hemp cable, which was developed by the Honourable William Elliott, a member of the Board of the Admiralty. Whichever is correct, the Elliott's Eye was originally adopted for use of the Executive Branch of the Royal Navy in 1856, and was applied to all officers by 1918. Variations were later developed on the establishment of the Royal Naval Reserve and the Royal Naval Volunteer Reserve. 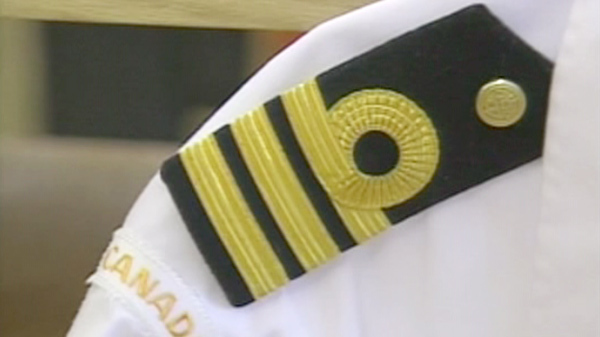 Different branches were identified by different coloured cloth in the middle of the braid, which can still be seen with the medical branch of the Royal Navy. Argentina, Australia, Bahamas, Bangladesh, Barbados, Belgium, Brazil, Brunei, Canada, Colombia, Congo (DRC), Cyprus, Denmark, Estonia, Fiji, Gabon, Ghana, Greece, Iceland, India, Iran, Italy, Jamaica, Kenya, Latvia, Lithuania, Malaysia, Mauritania, Mexico, Morocco, Mozambique, Netherlands, New Zealand, Nigeria, Norway, Pakistan, Panama, Poland, Portugal, Qatar, Romania, Slovenia, South Africa, Spain, Sri Lanka, Sweden, Thailand, Tonga, Trinidad & Tobago, Tunisia, Turkey, United Kingdom, Uruguay, Venezuela and Vietnam.